Once you have committed to making an extraordinary cup of coffee at home there are some steps you must consider. Initially you will want to purchase the best beans that you can find. If you live in an urban area there will probably be retailers of quality beans nearby. However if you live in a rural area you may choose to order your beans from an internet source. Either way you choose, you will want to review the retailers reputation to ensure you are purchasing the best beans possible. Now that you have your beans you will be wondering what are the most effective ways to store them until you are ready to use them. It is wise to only grind beans with your quiet coffee grinder as you are ready to use them. Ground coffee loses many of it subtle flavors within 24 hours. Many people believe that freezing beans is the best means of storage. This is still a storage option up that is heavily debated. If you choose to store this way, only freeze once, never try to refreeze unused beans. Freezing coffee beans requires that you place them in an airtight container. Be sure to label with date and variety. Let’s be reasonable if you do freeze your coffee beans limit it to no more that 6 months and then use it or toss it. Coffee beans do not have a decade long freezer life. If you are planning to store your coffee beans in a container, you will want to make sure that it is non-porous and has an air-tight seal. There are containers made from glass or stainless steel specifically for this purpose. Any retailer selling high quality coffee beans will also have a selection of storage containers for you to choose from. You will want to be sure that your container is kept in a cool dark place away from direct light. 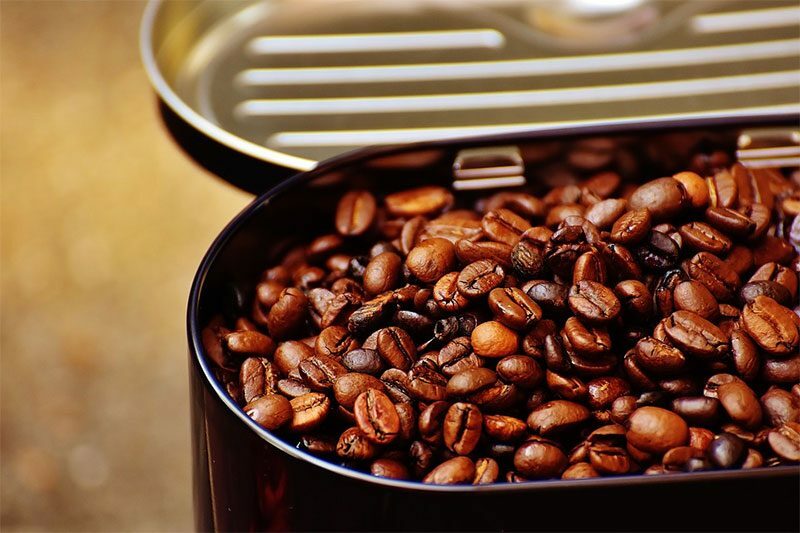 A most important aspect of storing coffee beans is minimizing the exposure to moisture. Excessive moisture will cause fermentation and possibly cause mold to grow. This will ruin your coffee beans and you will want to dispose of them. So, what’s the best way to store coffee beans for a long term? It is recommended that you purchase only what you can use in a few weeks. It is better to purchase a small amount frequently than to purchase a large amount and attempt to store them for a long period. You will be disappointed trying to store coffee beans for longer than a few weeks. The subtle flavors that are desirable from the most delicious and sought after coffee beans will be lost with long term storage. Buy small lots that you can enjoy in a short periods of time, and then purchase more as needed. You will have the best results and the delectable coffee that you desire, if you handle your purchases this way. Small quantities, carefully stored, and ground when ready for use will bring you the fragrant aroma, rich flavor and ambiance that you so enjoy from a carefully, lovingly and well prepared cup of coffee and you will want to share with those you love. Previous Post: « Espresso Beans vs. Coffee Beans – Is There Really A Difference?